Take it from someone who can barely draw a stickman: You can totally do this. Learning how to orient, resize, and paint 3D objects within Paint 3D is essential. 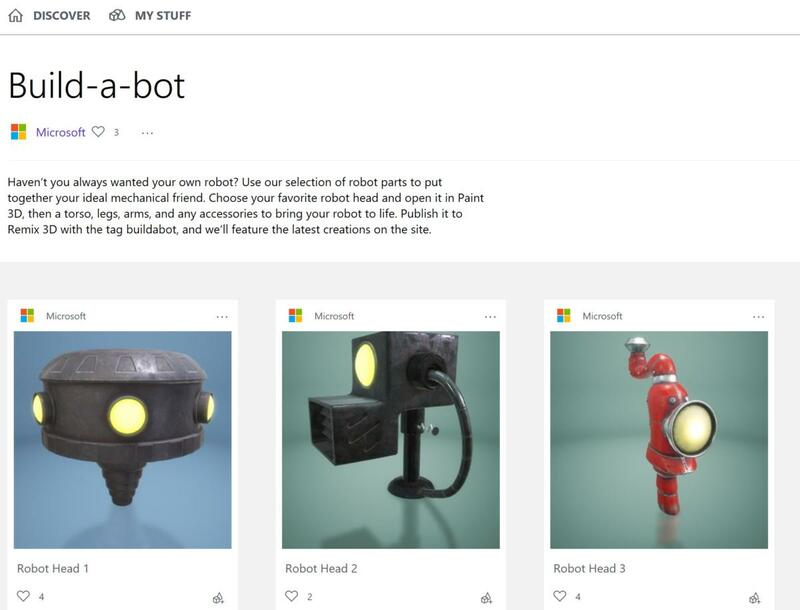 But Microsoft also provides a massive storehouse of pre-rendered 3D art on its community site, Remix 3D, to populate your scene without spending the time to create your own objects. Once you’re done creating a 3D object or scene, you can share it on Remix 3D, of course. No, you can’t make this in Paint 3D, as this chest was created in Maya by Microsoft. But you can still add it to your scene, and digital artists may be able to upload their own professional art later as part of the Khronos Foundation’s glTF format. In the upper-right corner of the Paint 3D app is the Remix 3D icon (which looks rather like the Share icon in Office). Click it, and a sidebar opens, opening the Remix 3D doors. 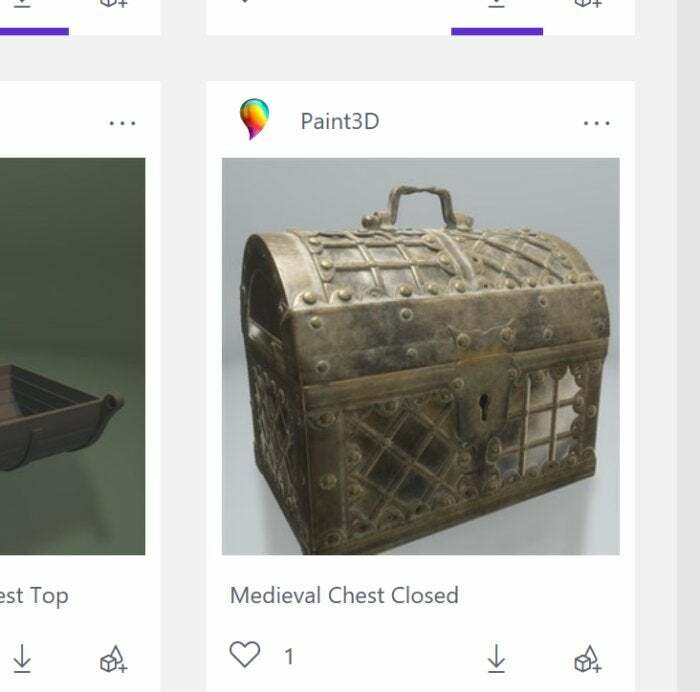 Remix 3D provides a virtual Board for bookmarking objects you might want to reuse, but the most useful feature is right at the top: a search box, where you can search for items like “pine tree” or “treasure chest.” There’s quite a lot to choose from. Microsoft’s Remix 3D Web interface is unnecessarily confusing and should be avoided. Just use the in-app sidebar instead. 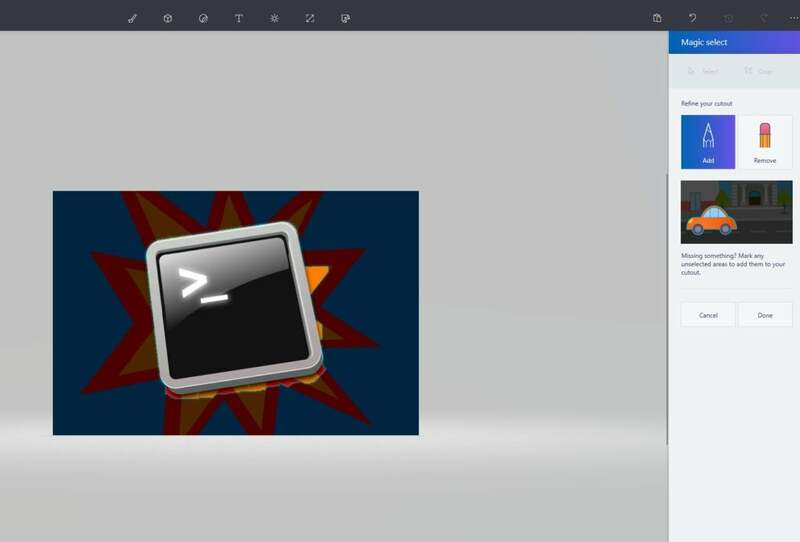 Each object has a Download icon under it, which will open the object inside Paint 3D, or you can save it to your Board. Don’t go hog-wild, though. What Microsoft doesn’t tell you is that each 3D Paint scene has an upper file-size limit: 64MB at this writing. Most of the custom art inside Remix 3D is made with professional 3D modeling tools, so not surprisingly each object can quickly consume your file allotment. Just one robot head in Microsoft’s “build-a-bot” collection required 14MB. At no point does Microsoft’s Paint 3D reveal that there’s a file-size limit to what you can upload or save... until here. Paint 3D allows you to upload your creations to Remix 3D, but you can also save them within the app or even export them as 2D or 3D files. It’s up to you: are you creating a 3D object, or a 3D scene? If you’ve used Photoshop, think of Magic Select as the Magic Wand of Paint 3D: a tool to intelligently guess which part of an image you want to extract and paste somewhere else. It’s both constructive and destructive: You can snip out an unwanted bystander from a photo, and Paint3D will “fill in” the background. Magic Select “knows” where the unwanted object ends and the other begins, so everything looks nice and neat. You can use Magic Select as a tool for either 2D or 3D content, but I’d encourage you to use it in 2D mode, then import it as a 3D texture if you want. Here’s how. Go to the Settings menu and turn off Show Perspective. This puts Paint 3D in a 2D mode, much like traditional paint. Then open an image file. Essentially, this will fill the entire canvas with the image. Once you've selected part of the scene with Magic Select, you may need to fine-tune the selection. Here, the bright-orange part of the scene needs to be removed. Click "Remove," as well as the portion of the scene, to remove it. Once in the Canvas tab, select what you want to remove with the Select button. (Select creates a rectangular box, but don’t worry about making your selection too precise.) Then press Magic Select. Magic Select will make its “best guess” as to what part of the scene you want to select. Two tools will help you fine-tune it: “Add” and “Remove”. Just click one or the other and select the appropriate area. Magic Select usually does a great job, though tufts of hair (through which the background can be seen) defeat it. Once Magic Select selects what you want, you can take the cutout and “pull” it out of the scene. If you do so, Paint3D will make another intelligent guess and “fill in” the background. But if the cut-out image is what you want to keep, you can simply CTRL + X (Cut) or CTRL+C (Copy) it to somewhere else; as a texture you apply to another Paint 3D object, or maybe just as another 2D image within Paint, PowerPoint, or something else. It's silly that this great tool isn't part of the generic Paint app, but you can still save your creation and make additional edits with Paint or other apps. 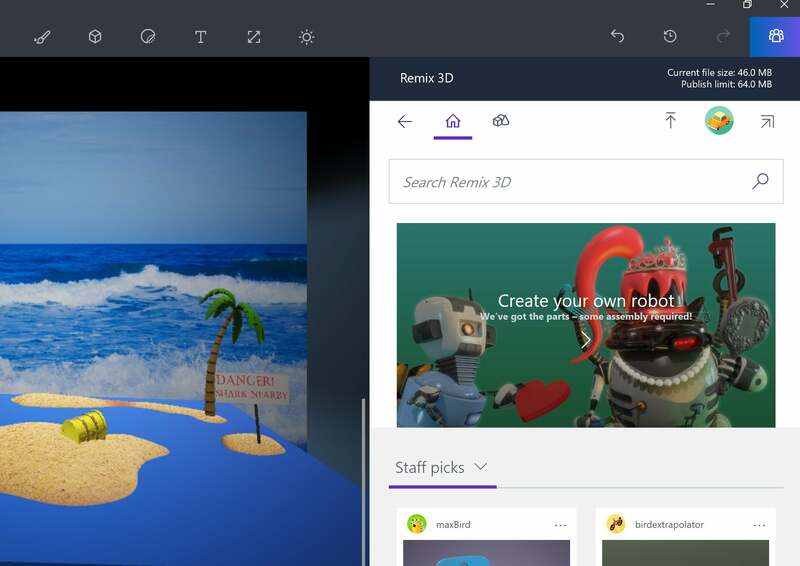 At one point, Paint3D was seen as a gateway to Build 3D, an app that would allow you to 3D print your creations. Within the Windows 10 Fall Creators Update, Build 3D is gone, as is the View3D viewer. Instead, Microsoft wants you to combine 3D content and the real world in a new way: via the augmented-reality Mixed Reality Viewer app and photos. 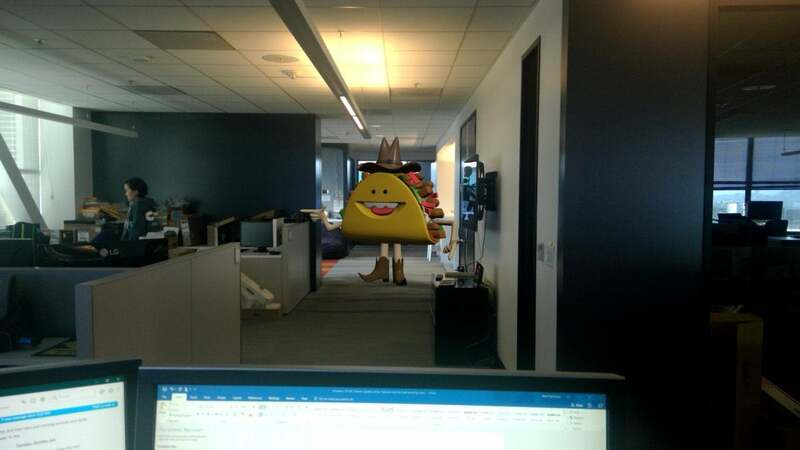 Watch your back, pardner -- there's tacos about! Mixed Reality Viewer is Microsoft’s take on augmented reality. Using a Windows tablet with a rear camera, Mixed Reality Viewer shows you what the camera “sees”: a desk, perhaps, or a hallway. If you’ve saved a Paint 3D object, you can then “drop it into” your scene, and rotate and resize it anywhere you’d like. (You can use 3D objects from Remix 3D, too.) Mixed Reality Viewer is smart enough to recognize a real surface and use it as an anchor point for the 3D object. It’s not wholly intuitive. You’ll want to either open Menu > Open for the appropriate 3D object, or look for one within Remix 3D. The “Mixed Reality” tab within the center of the screen then opens the augmented reality camera. Ignore the Controls controls, as they assume you have a mouse tethered to the tablet. Instead, place objects by double-tapping the point where you want them anchored, and resize them by pinching and zooming. Then take a photo, and save virtual reality on top of reality. If there's any drawback, it's that you need cooperative subjects. Since you're adding 3D objects in real time to a live scene, getting kids to hold still while you add a rampaging dinosaur to the scene can be a challenge. Still, the results can look fantastic. Make no mistake about it: Paint 3D is a lot of fun, more than I ever thought it would be. Simply by getting creative with features like the 3D Doodle and Stickers, I was able to create a simple scene that I was rather proud of. How did I do it? I’ll walk you through it in the attached video.